(c) both D.C. as well as A.C.
5. Which of the following is not a vector ? 7. Which of the following materials has the highest value of dielectric constant? 8. Which of the following capacitors will have the least variation ? 9. Which of the following capacitors has relatively shorter shelf life ? 15. 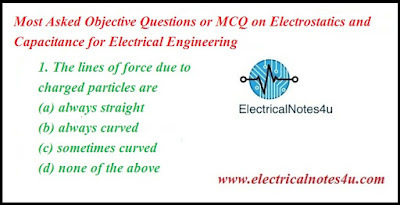 Which of the following material has least value of dielectric constant ? 16. Which of the following capacitors will have the least value of breakdown voltage ? 17. Which of the following capacitors is marked for polarity ? 18. Which of the following capacitors can be used for temperature compensation ? 22. capacitors can be used only for D.C.
29. Electric displacement is a______quantity. 33. Out of the following capacitors of identical rating which one will have the smallest dimensions ? 42. Which of the following capacitor is preferred in case of single phase motor ?